Mom, dad, four grown youngsters marching across drought-stricken pasture far from home. Breasts are muddied from running aground in shallow water. Even the cedar trees behind are brown from thirst. My pair of wild mute swans, which returns faithfully every year to the beaver pond to raise a family, finally gave up on me and set out with their brood to find a new abode. They come before the ice is melted to get an early start on their housekeeping. 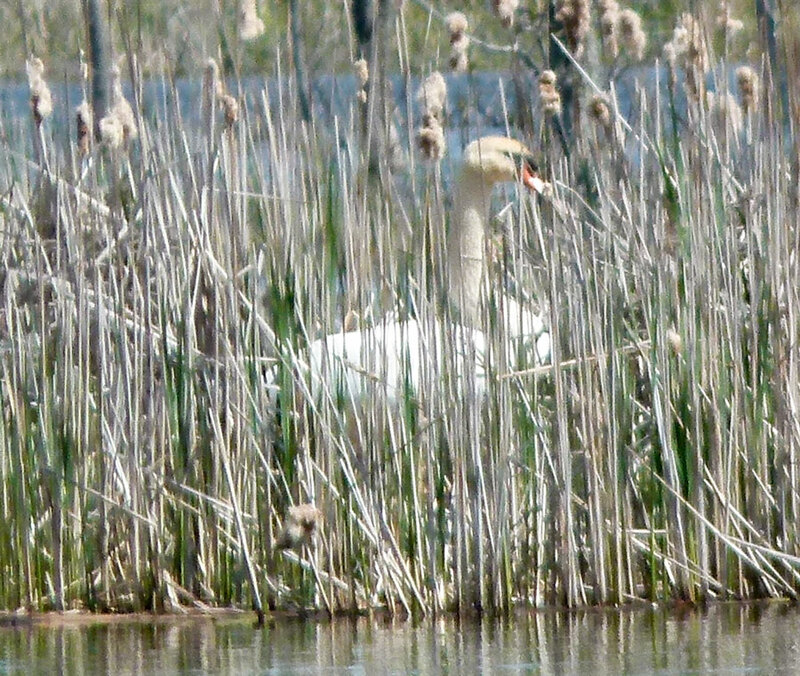 Mom can be seen on her nest among the reeds long before the leaves come out. The pair hatch their babies and watch over them fiercely while the little ones learn to paddle and poke about in the water for food. You can’t sneak up on them. They know where you are hiding and calmly glide away to the opposite side of the pond, the youngsters with mom in the lead and dad guarding the rear. Mama swan getting a very early start on her nest in spring. Despite their vigilance, they haven’t escaped the perils that lurk in and around the pond. They hatched seven cygnets, four managed to grow up. Who knows what picked off the others. Perhaps a big snapping turtle attacked from below. Perhaps a coyote got lucky. Perhaps one of the bald eagles returning to the county swooped off with a tender lunch. Whatever happened, it must have been a fast grab and run for papa or mamma swan in full battle mode can drive off just about anything. As the pond dries up, the swans have been pushed back into a shrinking body of water. The large expanses at the front have become arid regions of cracked mud but there is still a decent amount of water covering the old farm pond and extending back into the trees. Quite enough, I thought to keep the swans happy until migration time. So imagine my surprise when I spotted the entire family far from the pond and marching solemnly along the page wire fence that separates the field from the road. At once, a truck screeched to a halt with a couple who insisted that the poor things were looking for escape and the coyotes would get them all if I didn’t open the gate at once and let them onto the road. Oh sure, you can just imagine their chances out in traffic and there was no way they would make their way down the vertical escarpment to the marsh. I told the agitated folks to let nature take its course and leave the birds alone. The couple drove off, much ticked with me. The swans turned around in a leisurely manner and started heading back toward the pond. They showed little fear of people and no inclination to rush. Besides, I’m certain they could all fly perfectly well if they wanted. It was probably a scouting trip, or an excursion to educate the children about what happens beyond the pond when it doesn’t rain. From the mud on their breasts they have been running aground a lot in shallow water. Swan family back when they still had all seven babies. The Hamilton Wetland, normally a daily hotspot, is deteriorating due to dropping water levels. While there is still water in the back part, out of sight from the road, the front part is little more than blackened waste with the slough gradually loosing its appeal to birds. In fact, yesterday, a family of MUTE SWANS was marching across the dry pasture field, presumably in search of more hospitable abodes. They may have found it as only 2 MUTE SWANS were there last night among the paltry nine species present, including 80 CANADA GEESE, 30 MALLARDS, 4 GREAT BLUE HERONS, 2 GREAT EGRETS, 1 RED-TAILED HAWK, 2 LESSER YELLOWLEGS, 5 AMERICAN CROWS, and 2 black capped chickadees. I wish the swans good swimming and plenty of chow wherever they set up residence.